After spending some time in Singapore, I came home craving a lot of the dishes I had sampled. One of them being this Five Spice Pork Roll or Ngoh Hiang – we tried different versions around Singapore, but StalkerBoy Mama’s recipe takes home the gold. I’ve been searching for this in NYC without any luck, so imagine my joy when I found it in Laut. What is Ngoh Hiang? Well, think of it as a spring roll but elevated. Instead of the regular wrap, they use yuba (a thin layer of film formed when you cook soy milk). The meat has a nice explosion of aroma from the five spice – think star anise, cloves, Chinese cinnamon, fennel seeds and sichuan pepper. Then you deep fry it and serve it with a sweet plum, syrup like dipping sauce. This stuff is fantastic. Crunchy exterior. The meat has a bite to it while mixing with all those flavors. Coming together with the contrast of the sauce. 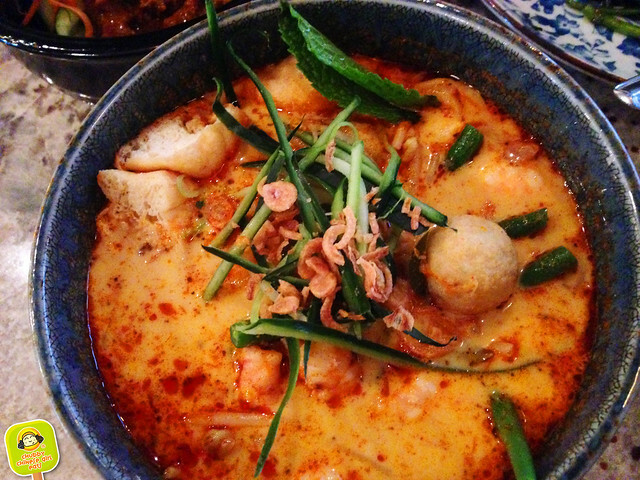 Another favorite of mine is the Curry Laksa. Different Southeast Asia regions have a slightly different version. Some very sour others, like the Singaporean take, is a spicy curry based with coconut milk. Laut’s is a hearty bowl with string beans, cucumber, fish balls, tofu puffs and a little mint. Not exactly like the Katon Laksa – I was hooked on, but a decent version that hit the spot and unlike any I’ve had in NYC. The broth is a little spicy with a sweet lingering finish. There’s a variety of textures that play nicely with the noodles. Seriously, a solid bowl of soup noodle. I think at times, I would happily take this over ramen. 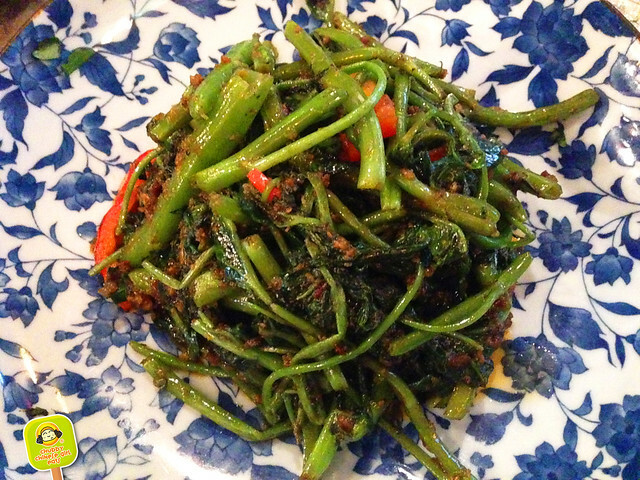 Kang Kong (water spinach) is a really popular dish. My must order in any Malaysian restaurant. It’s not difficult to replicate this at home, but the spicy shrimp paste (bellman sauce) would stink up any apartment for days! 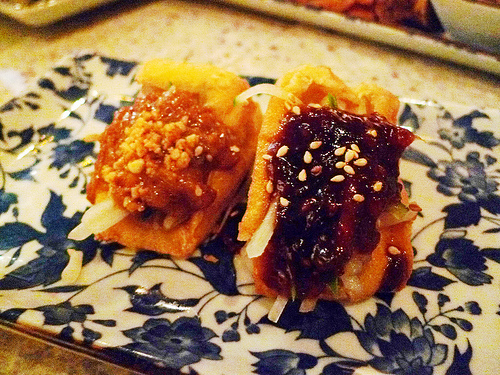 Like stinky tofu, these dishes are best left to the professional kitchens. The flavors of pungent shrimp, sweet and spicy bits here and there isn’t for the “light” palate. But I love this combo. More so than the cantonese version with fermented bean curd. I would be perfectly happy with this and coconut rice, but Laut’s rice is a bit on the toothsome side for me – my only complaint. I like my rice round and puffy, don’t you? 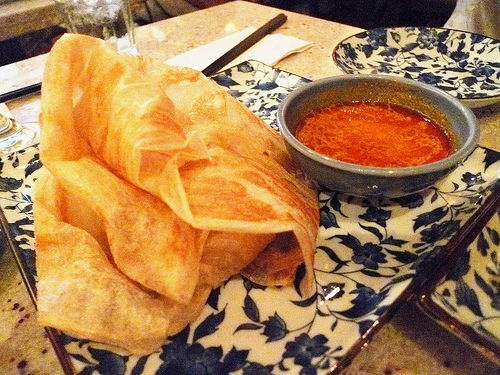 We were pleasantly surprised to see Roti Jala, a lacy Malaysian pancake with spicy curry dip on their menu. Most Malaysian restaurants will have the usual Roti Canai and Roti Telur, but not the lacy beauty. We can’t wait to return for it. 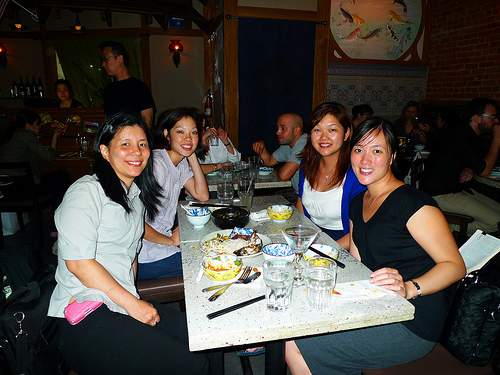 We celebrated my friend Cindy’s Birthday at Laut, currently participating at Malaysian Restaurant Week (Now through June 20th). $20.10 sounds pretty reasonable for a 3 course meal, but when it come to Malaysian food, I’m use to Chinatown prices. It took some convincing from my Malaysian co-worker, who assured me with its authentic flavors. I’m willing to pay a little extra for good food, so off we went. 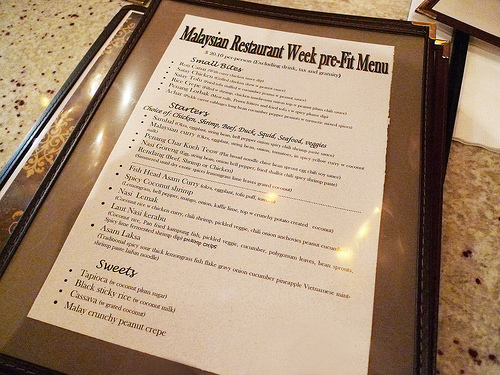 The friendly manager confirmed that only the most authentic Malaysian dishes are featured on their Restaurant week menu, all of which are part of their regular menu. I was glad to hear that, a nice change from some restaurant week deals that are really off. We ordered 4 pre-fixe and shared it family style. 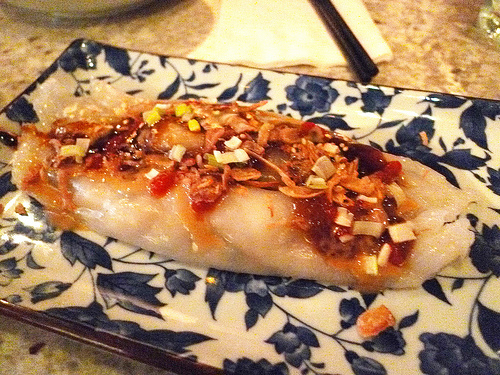 The Rice Crepe has a soft stretchy wrap that was just right, filled with shrimp, chicken, mushroom mixture, topped with peanuts, fried crunchy onions and a sweet and sour plum chili sauce. The wrap sort of melts in your mouth with a fantastic texture, I liked it better than a dim sum cheung fun. 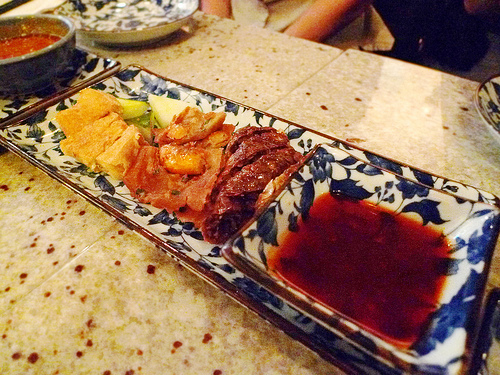 The Penang Lorbark is like a Malaysian pu-pu platter, I mean that in the best way possible. Starting from the top, the fried tofu is crunchy on the outside and soft in, nothing special without the spicy plum dipping sauce. In the middle we have the prawn fritters, super crunchy pieces scallion dough, deep fried with a prawn center, great snack alternative to shrimp chips if you ask me. Last but definitely best was the meat rolls. 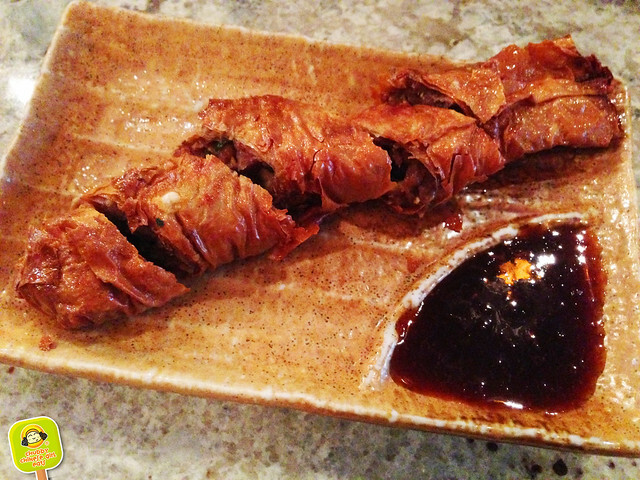 Yummy meat mixture is wrapped with a thin tofu skin sheet, rolled and deep fried. Nice crispy texture on the outside, and savory in, a must try. Their classic Roti Canai was as good. Crispy, stretchy, chewy and slightly sweet calls to be dipped in that yummy curry chicken. As good as any good roti canai I’ve had. Satay Tofu is a fried tofu cut open and filled with cucumber and jicama. The one with the peanut sauce on the left has more texture from the crunchy peanuts and the nutty flavor goes really well with the whole package. The right one is plum sauce, it was a little jam like for me. This combo is like a Malaysian Peanut butter and jelly sandwich. 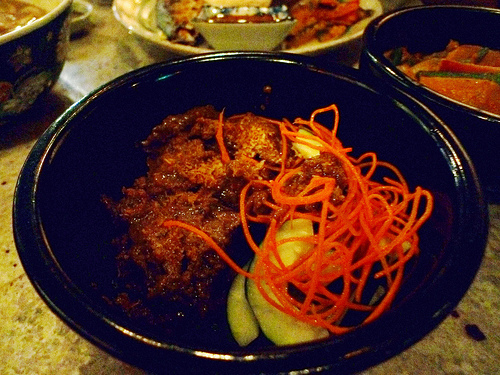 My coworker told me about a fabulous beef dish, Rendang. It has a punch of lemongrass flavor, a hint of lime, a handful of spices and topped with grated crunchy coconut. A little sweet, very tender meat. The lemongrass lime flavor stays way after the beef is gone. Went really well with rice. A better version than your usual Malaysian joint. 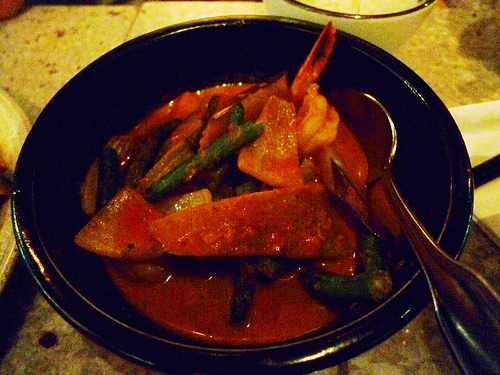 Malaysian Curry with Shrimp had tons of vegetables, okra, eggplant, string beans, tomatoes and onions. It wasn’t as spicy or strong as some Indian curries can be, instead it had rich coconut flavor and a mildness to it that was bold yet mild. 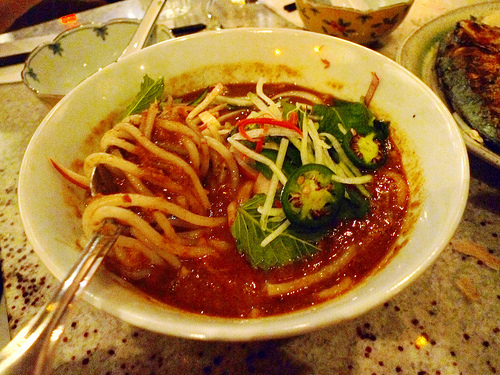 Their Asam Laksa might be the closes version to the real thing you’ll find in NYC. According to my friend, it’s not as spicy as the one she had in Malaysia, though it was burning ma’ lips. There’s no mistaken the amount of lemongrass, the spicy and sour thick gravy along with fish flakes, shrimp paste and al dente laifun noodles. It awakens all your senses, spicy, sour and pungent fishyness all wrapped up in one bite, while hints of mint, cucumber and pineapple try their best to cool you down in between bites. If the taste isn’t strong enough, you can add more of that fermented shrimp paste on the side, I skipped, but this is addictive indeed. We wanted to try something new, not knowing the fish would come whole, and would bring along sharp fishy and salty odor like that of salty chinese fish with a texture of mackerel. 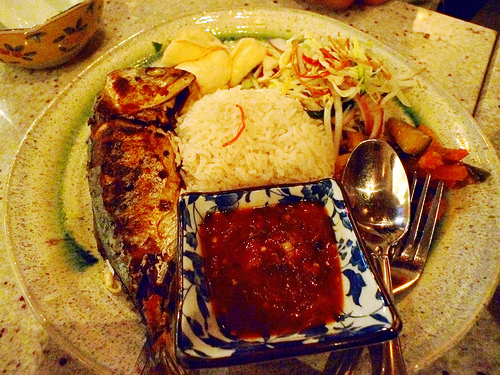 Laut Nasi Kerabu came with coconut rice which was the best part of the dish. The rest, I skipped mostly except for the harmless shrimp chips and pickled veggies. The whole pan fried Kampumg fish was too much for us to handle, lots of bones, salty and too strong. Surprisingly enough, the spicy lime fermented shrimp dip on the side was quite good and covered the fish’s original flavors very well. 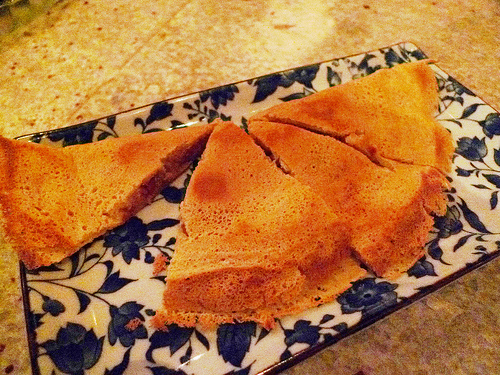 Malay Coconut Crepe was a sweet surprise. The pretty green wrapper had the a soft chewy texture like really good mochi. A thin layer holds a filling of dark sweet coconut, like those really good asian coconut candies. As you chew, softness and texture releases a deep coconut flavor. Sweeeet. The Tapiocawas cooked just right, and topped with a coconut plum sugar. Sort of like burnt brown sugar, with a hint of tartness. 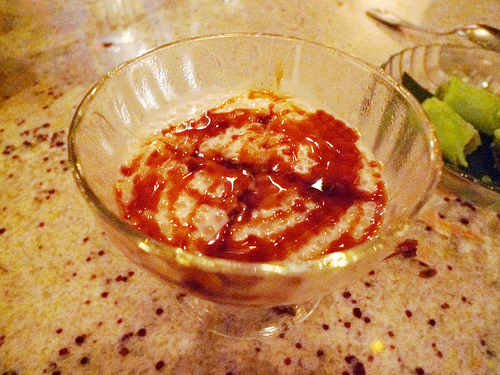 Coconut in desserts is such a perfect paring. Cool, soft, and very tropical. 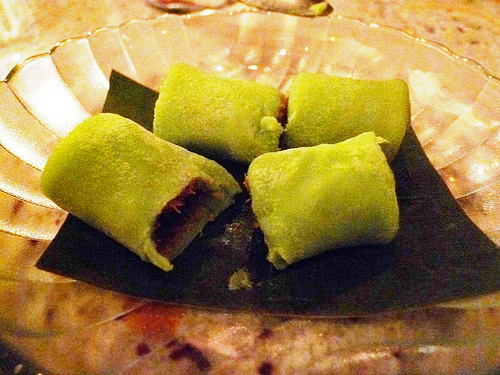 Malay Crunchy Peanut Crepe has a crunchy nutty and shredded coconut filling. Nice textures accompany a soft and crisp exterior. Good, but the other 3 desserts are much better. 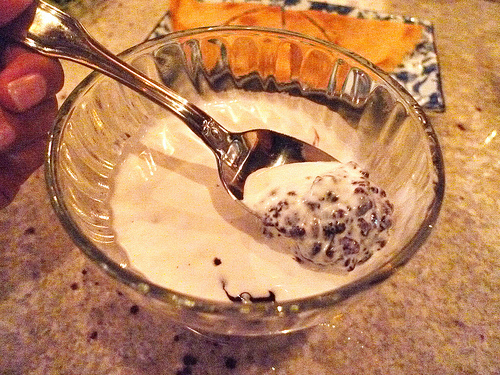 Black sticky rice is soft but also a nice chewyness to the sticky rice. Soaking in a rich thick coconut milk, each spoonful is filled with a pleasuring sensation of coconut heaven. I can surely eat this over and over again. Though prices were a little higher than usual, the authentic flavors did make up for it. They claim that some of their dishes are so authentic and rare, no other NYC malaysian restaurant makes it. Service was friendly and inviting. But I still have Nyonya as my favorite Malaysian, it’s hard to beat love at first bite, even if it isn’t as authentic, I guess I’m just more use to the Americanized flavors. It says "Pre-Fit" menu in the pic. Does that mean one shouldn't go there while on a diet?